On October 22, 2014 Food Futures NL, an interdisciplinary research project on the food system in Newfoundland and Labrador, organized a roundtable discussion about the future of food in the province. Food Futures NL originated from FARM, a Memorial University initiative focused on promoting under and postgraduate research on sustainable food system in NL. The panelist and the attendees discussed on how to develop a healthier, sustainable, and affordable food system. 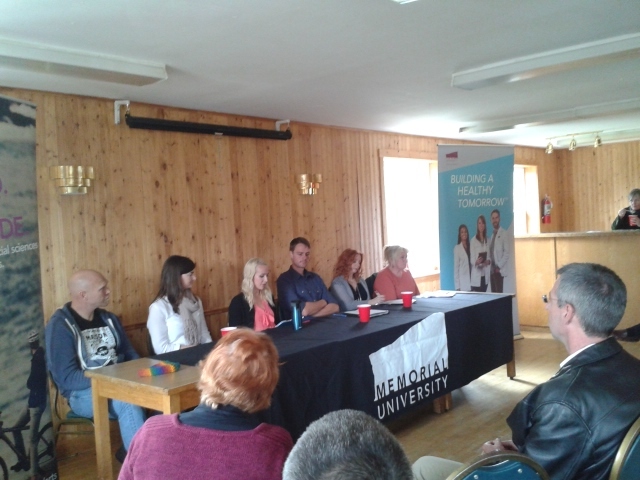 The panelists included Todd Perrin (Mallard Cottage Restaurant), Andrea Maunder (Bacalao Restaurant), Evan Murray (Murray Meadows Farm), Mary Lester (Lester’s Farm), Kirstie Jamieson (Food Security Network NL), and our own TBTI Master student Chloé Poitevin. Chloé, who studies alternative fish food networks in Newfoundland, emphasized the role of small-scale fisheries for food security, community viability, and resilience. She noted that the current constrictive regulations prohibit the direct access of local fish to consumers and restaurants, which makes NL the only marine fishing province in Canada that completely prohibits the direct sale and purchase of fish. Participants argued that we will not be able to achieve healthier, sustainable, and affordable food in NL if the present regulatory processes continue to be as they are: complicated and lacking in support of local food initiatives. Also, more effort needs to be put towards educating people, especially youth, on the issues of food security and sustainability. Educated consumers, it was stressed, are the ones who can and will bring the necessary changes to the food system in NL.